Disclaimer: Pictures were taken with a little Point & Shoot camera. Photo quality isn't the greatest, and I've yet to master Photoshop! 1. This weather is absolutely insane! Insane, I tell you! 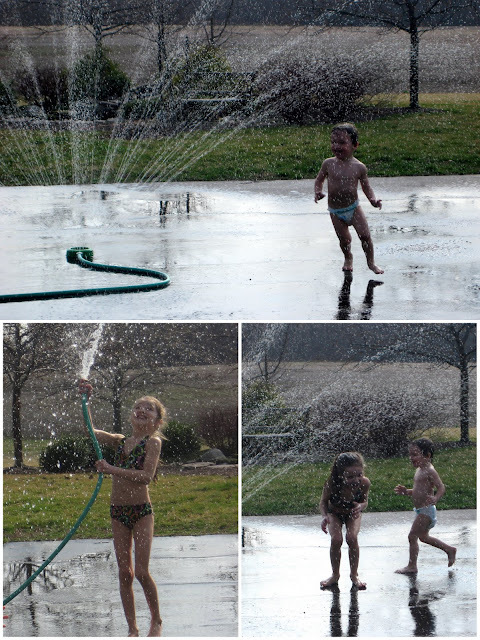 Guess what the kids were doing outside...in MARCH? They were playing in the sprinkler! Between the weather and Daylight Savings Time, I'm so confused that I feel like I've stepped into some Quantum Leap episode. Next thing you'll know I'll be in the middle of a football field getting ready to kick a field goal. With my history, I'm guessing that wouldn't end well! 2. Daylight Savings Time is NOT our friend! Poor Logan is so confused that he's sleeping during the day and asking to "Pay, mommy. Pay!" at night. No, he's not asking for money...yet! For those of you not fluent in "toddler", he's wanting to play OUTSIDE at 11:00pm. Really? Needless to say, we're getting even less sleep around here than before...and that's not good, people! 3. I have an irresistible obsession with Faygo Redpop. I mean, it's BAD! While grocery shopping, I noticed a case of it buried under some not-so-exciting sodas. I totally freaked out and quickly swiped it up before some less deserving soul took it. Granted, I've been by this said soda display later in the week, and for some unknown reason, there's still Faygo Redpop sitting there! Seriously? This is a hot commodity. Why isn't anyone else buying it? 4. Speaking of Faygo Redpop...I've recently read that someone who carries a "spare tire" around their midriff is most likely suffering from stress. Yes, that wonderful muffin top I'm carrying is a result of too much stress in my life. It has nothing to with drinking a can (or two) of Faygo Redpop every day followed by one two a whole dozen chocolate chip cookies. Oh, no! Stress is the reason I have a complete wardrobe for every clothing size between 2 and 13! 5. I saw this great way to make "winter greenhouses" out of milk jugs on Pinterest. I thought this is a no-brainer. Cut a milk jug in half, add dirt, add seeds, use duct tape to put the jug back together, sit the "greenhouse" out in the snow, and viola...perfect little seedlings emerge in time for spring planting. I was so excited when I finished this project! However, I didn't take into account the weather becoming incredibly nice and a certain little someone deciding to scatter the contents of the said greenhouse across the lawn! Guess I'll never know if it actually worked! I'm adding a new board to Pinterest titled..."Pins Foiled By Toddlers". It will go right next to my board "Projects Ruined by Yours Truly". My "Successful Pins" board is still quite bare! Can't imagine why.